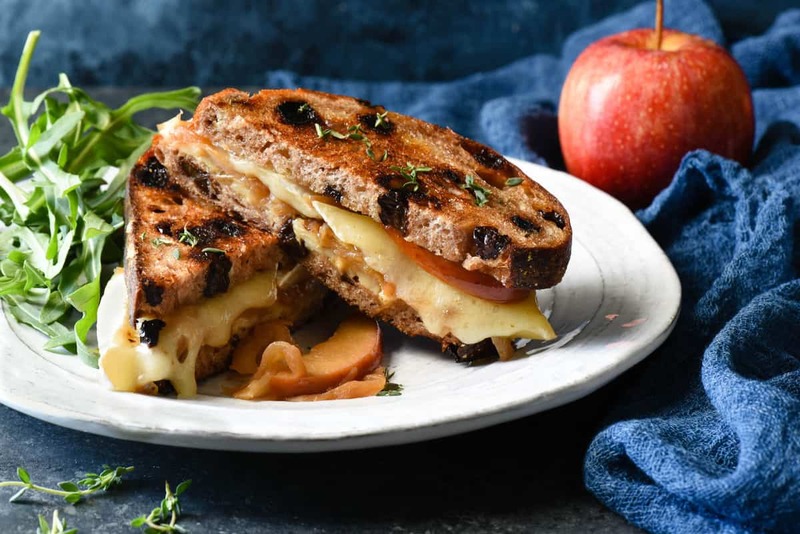 This Apple Grilled Cheese is an irresistible combination of sautéed apples, sweet caramelized onions, brie and white cheddar cheeses, Dijon mustard and walnuts. It’s the best toasted sandwich you’ve ever made at home! Ask me about the best foods I’ve ever eaten, and I guarantee you the answer will involve a dish that is a combination of several of the five basic tastes: sweet, savory, sour, salty, bitter. You know how when you watch TV cooking competitions, and the judges will often refer to a contestant’s dish as “one note”? That means that the dish they’ve prepared is overwhelmingly sweet, or JUST sour, or way too salty. These TV judges (and smart home cooks) know that balancing flavors is the key to making people want to take another bite of a dish. And another. And another. 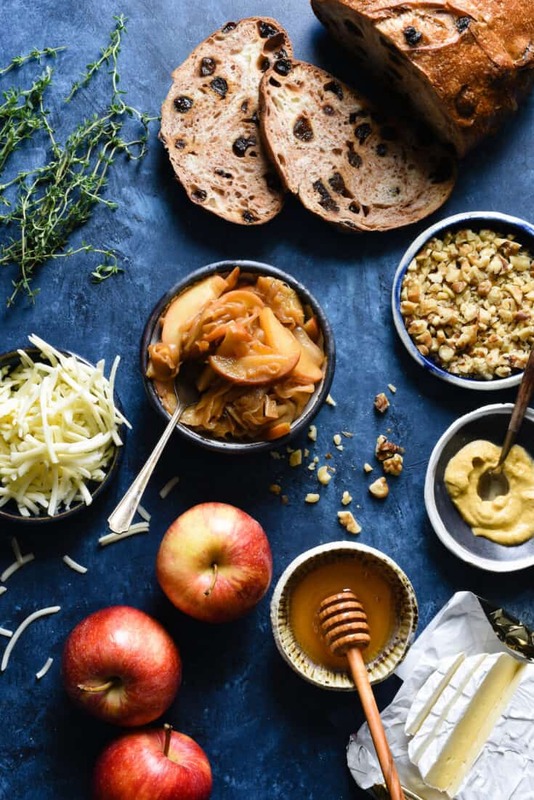 This Apple Grilled Cheese is all about balance. 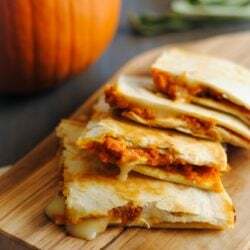 The sweet caramelized onions and apples balance with the savory blend of white cheddar and brie cheeses. The bitter Dijon mustard and crunchy walnuts provide even more flavors and textures that make this the best toasted sandwich you’ve ever made at home. Steps 1 and 2 take a little bit of time, because properly caramelizing onions can’t be rushed. But it’s not active time where you’ll have to stand at the stove (just come back to the kitchen once in awhile to give everything a stir). You can also do Steps 1 and 2 up to 3 days in advance, and refrigerate the mixture until you’re ready to build your sandwiches. 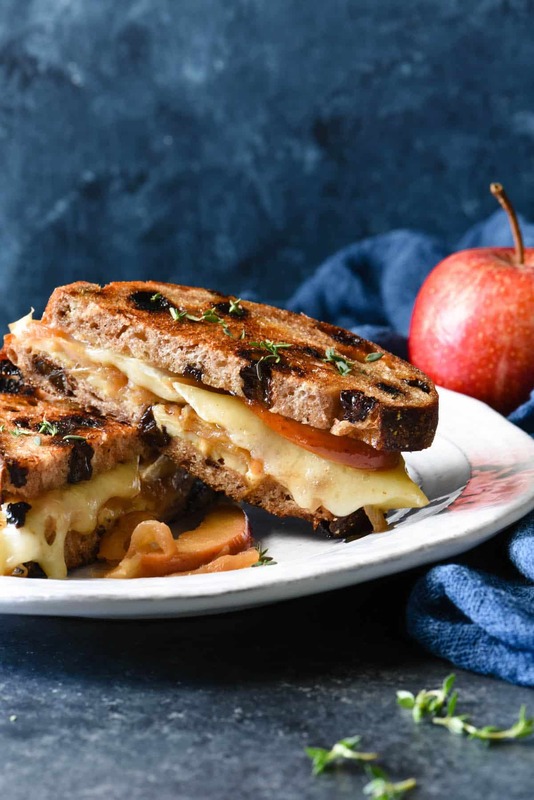 This Apple Grilled Cheese is an irresistible combination of sautéed apples, sweet caramelized onions, brie and white cheddar cheeses, Dijon mustard and walnuts. It's the best toasted sandwich you've ever made at home! Heat 1 tablespoon butter in large skillet over medium-low heat. Add onion and cook 30 minutes or until dark golden brown, stirring occasionally. Add apple, thyme and water; cook 10 to 15 minutes or until apple is very soft and water has evaporated, stirring frequently. To build sandwiches, place bread slices on work surface. Spread mustard on 4 slices of bread, and drizzle honey on remaining 4 slices of bread. Divide apple mixture over honey-drizzled slices of bread, and make sure mixture is evenly spread. Divide cheddar cheese over apple mixture; place brie slices over cheddar. 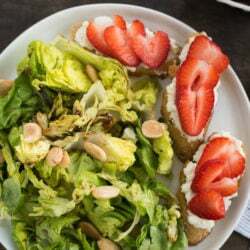 Sprinkle brie with walnuts. Place mustard-spread slices of bread on top, mustard side down. Heat remaining 2 tablespoons of butter on griddle or in large skillet over medium heat. 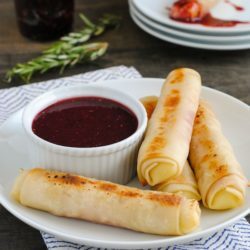 Working in batches if necessary, add sandwiches to griddle and cook 8 to 10 minutes or until bread is very toasted and cheese is melted, turning frequently. Cut sandwiches in half to serve. Mushroom Duxelles & Asparagus Grilled Cheese – a “home chef” style grilled cheese! Brie, Tomato & Red Onion Grilled Cheese – for the brie lovers. It sounds delicious! Love the mix of ingredients! Fabulous! Very fancy for a grilled cheese sandwich! And very intriguing. I just may have to try this one. Thanks so much, Susan. And welcome home! Your trip looked amazing from your e-mail newsletters.